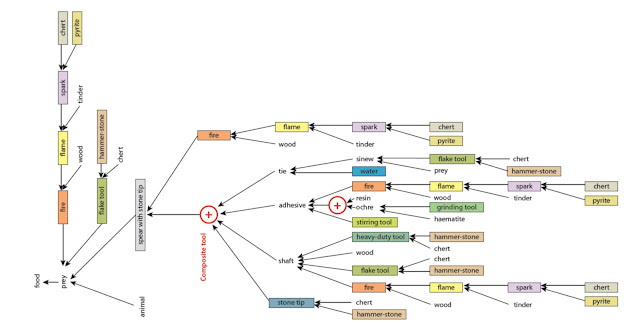 Here is a paper by Marlize Lombard & Miriam Noël Haidle that develops and applies a visualisation technique to describe the complex series of actions required for tasks such as making a fire, using a composite, stone-tipped spear and making and using a bow and arrow - three vital technologies for human history. For various reasons increased effort has recently been made to detect the early use of mechanically-projected weaponry in the archaeological record, but little effort has yet been made to investigate explicitly what these tool sets could indicate about human cognitive evolution. Based on recent evidence for the use of bow-and-arrow technology during the Middle Stone Age in southern Africa by 64 kya, we use the method of generating and analysing cognigrams and effective chains to explore thought-and-action sequences associated with this technology. We show that, when isolated, neither the production of a simple bow, nor that of a stone-tipped arrow, can be reasonably interpreted to indicate tool behaviour that is cognitively more complex than the composite artefacts produced by Neanderthals or archaic modern Homo. On the other hand, as soon as a bow-and-arrow set is used as an effective group of tools, a novel cognitive development is expressed in technological symbiosis, i.e. the ability to conceptualize a set of separate, yet inter-dependent tools. Such complementary tool sets are able to unleash new properties of a tool, inconceivable without the active, simultaneous manipulation of another tool. Consequently, flexibility regarding decision-making and taking action is amplified. The archaeological evidence for such amplified conceptual and technological modularization implies a range of cognitive and behavioural complexity and flexibility that is basic to human behaviour today.